Match a personality and message to an audience, and you’ve got an influencer who can sway purchase power and societal tastes. Oh, and don’t forget, make a mint. But Facebook, Instagram and Twitter have been around long enough that they’re saturated and nearly impossible for building an influencer brand today. The next platform with the potential to build a brand from thin air is Facebook Messenger. 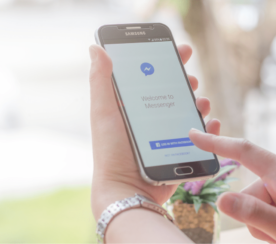 Millions worldwide use Facebook Messenger to communicate daily — and those users are incredibly receptive to chat-based marketing. Facebook Messenger is more than another place to talk to your friends. It’s also a diverse marketing tool that can be used to grow a business or brand online. Establishing your value on a platform before everyone else gets there. It’s used by billions of people daily yet very few companies and influencers are using it any scalable way. On social media, interactions aren’t unique or all that personalized. 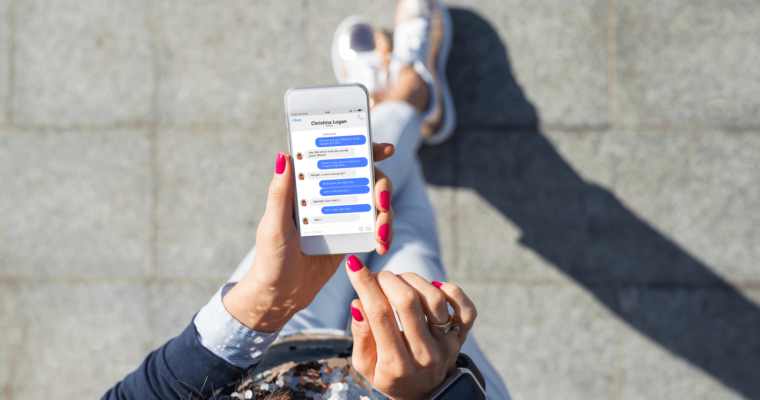 With Facebook Messenger chat-based marketing, you can have individual conversations that connect on a personal level. On Messenger, each message you send is delivered directly into one person’s inbox and isn’t a passing note in a rolling feed where you can never tell who saw it. 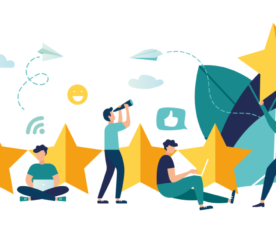 To use Messenger to grow your brand’s influence, here is the influencer’s guide to Facebook Messenger Marketing with actionable tips for making the most of your connection to your audience. 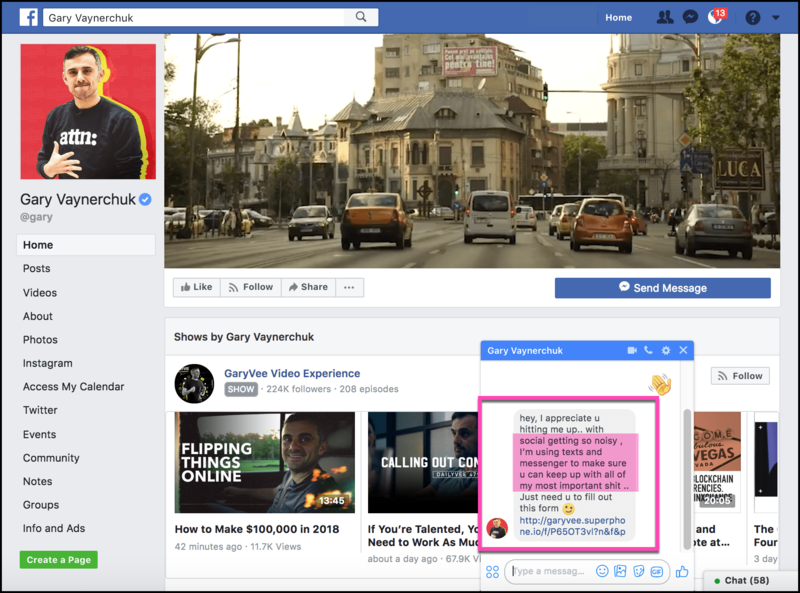 It covers how to get new followers and better connect with your audience using Facebook Messenger like Vaynerchuk and the biggest influencers. 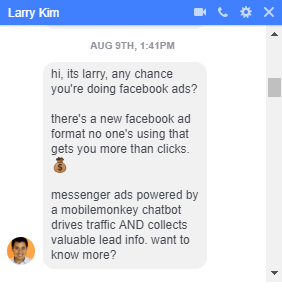 The tactics here are executed with the tools from my company, MobileMonkey, a Facebook Messenger marketing platform. 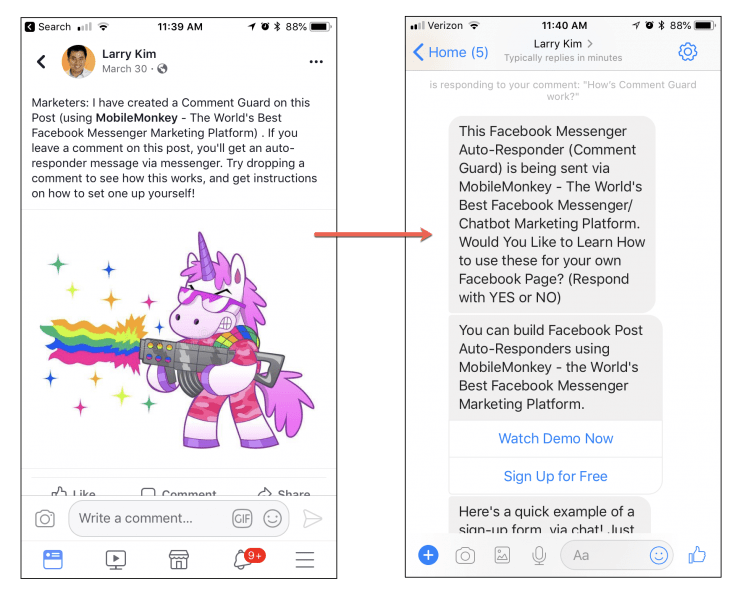 Facebook post autoresponders are a tool on Facebook that allows your Messenger chatbot to message people who comment on your Facebook organic posts. This is great, you’re already posting content on Facebook. Now turn people who comment on posts into contacts in Messenger. When users comment on your post, Messenger engages them instantly. You can even boost these posts or promote the content to new audiences to drive engagement. Everyone who comments can be added to your Messenger contact list. Did you know you can use your website as a Messenger contact growth tool? Add Messenger website chat to your website and anyone who contacts you here will become a Messenger contact. You have likely seen chat boxes appear on most modern websites in your space. Ones that allow you to connect with an influencer and their business or find content on their site. Better than live operator website chat is Messenger chat with a chatbot at the helm. People get instant responses, you can take over for the bot at any time, and the chat history is persistent rather than disappearing like live website chat. 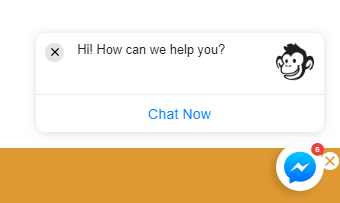 You can quickly install a Messenger widget on your website to answer FAQs, whether from the media, someone looking to book you for an event, or a fan. 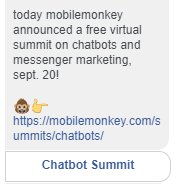 When users click on your Messenger chat from your website, it’ll launch them straight into a platform they’re comfortable using: Facebook Messenger. 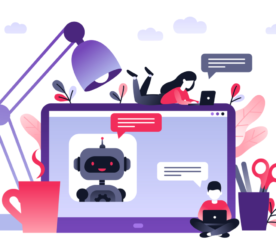 Having chat on your website can feel overwhelming, but if you’re using chatbots, you don’t have to personally respond to messages all day and can still build your contact list for chat blasting. 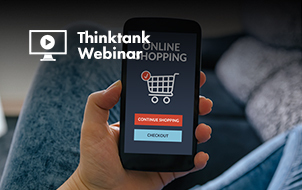 Chat blasting is one of the best new ways to engage customers with your content and promotions. So what exactly is chat blasting? It’s sending a mass message to your Messenger contacts, similar to an email blast campaign. When you have a new blog post or special offer, chat blast it to your Messenger contacts to the tune of 80 percent open rate. 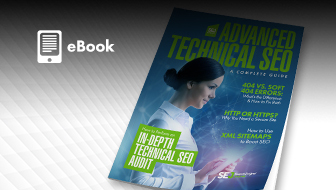 Watch your traffic skyrocket. Did you just release a new product or start a partnership with a new sponsor, for example? Chat blast a link to your contacts. You can use it for any content type or reason. Maybe you want to personally ask a question to your audience. Perhaps you want to promote new sponsors. Anything works with chat blasting, and it’s 10x as effective as email blasts. 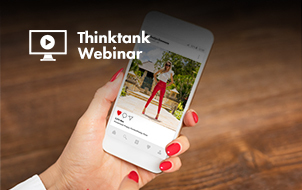 One key strategy that influencers have been using is releasing exclusive content on their chat blasts. This strategy helps to bring users from other platforms into Messenger contacts as they can’t access the content on any other social channel. Reserve chat blasts for your most popular and exclusive content to give users an incentive to follow you. Influencer marketing relies on one main thing: Getting your audience to continually engage with you. If you can reach your following once, that’s awesome. But it’s even better if you can do that on a consistent basis. Sponsors want to work with influencers that have an active following. One-off viral stunts aren’t sustainable. Audiences who love you and your content are. Your audience is your lifeblood, and without it, you aren’t really an influencer. To keep them engaged, build amazing drip campaigns that you can schedule in advance to deliver new content. 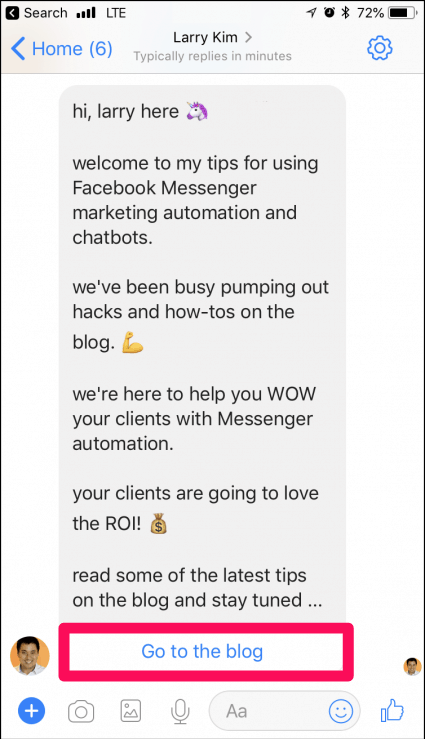 Just like you would with an email newsletter, you can use a chatbot to schedule drip campaigns on anything you want. Use drip campaigns to offer evergreen content that is high-value. For instance, hacks or blog content that your influencer network generally engages with on other platforms. Ask them questions about their goals and how you can be of assistance. Gauge their interest and use that moving forward to determine what content they see next. With a chatbot, you can automate this entire process! And you can use your blog as an RSS feed bot to deliver content regularly, like a newsletter. When you have events or promotions, collecting sign-ups and contact information is always a key step in building your influencer network. More emails and more contacts mean more opportunities to sell or convert or build brand awareness. But web forms can have disappointing conversion rates. People can abandon a page and leave no trace. 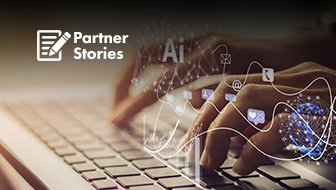 Messenger is a great alternative to web forms when collecting information because it collects user info in a natural-style conversation. You can lead people through the info-collecting process with easy button clicks and an engaging, conversational funnel. It’s really easy to build Facebook Messenger forms, too. Facebook Messenger is a prime candidate for influencer marketing and brands who can move fast to adopt first. There are unmatched engagement rates in Facebook Messenger. And with virtually no competition Messenger a great space to grow your voice in the increasingly noisy space of social media. Grow your network and influence with Facebook Messenger as your marketing platform.